The Scout trail is located at Glenwood Springs, Colorado. The trail begins off of 8th Street and makes a steep climb toward the summit of Lookout Mountain. For this post we branch off on the Forest Hollow trail that travels east into Glenwood Canyon high above the Colorado River. We turn around a little past the 5 mile point at the boundary of the BLM land and the White River National Forest. The Scout trail is one of the most popular downhill mountain bike rides in the Glenwood area. The trailhead is at the end of East 8th Street. There isn't a parking area near the trailhead so anyone using the trail has to park along one of the city streets. This trail is also commonly referred to as the 'Boy Scout' trail. That is probably because most people are more familiar with the Boy Scouts than they are with the scouts from the cowboy and Indian days. The trail was well established long before the first settlers entered the area. The Ute Indians used the trail to get to the sacred Yampah Springs which is now used to feed the world famous Hot Springs Pool. 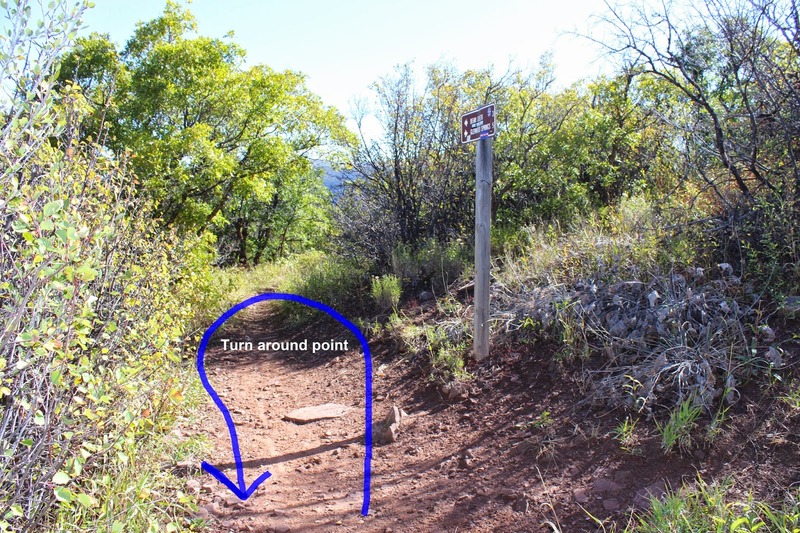 Virtually all mountain bike riders will be riding the trail in only the downhill direction but there is a sign at the trailhead that warns that advanced bicycle skills are required due to the steepness of the narrow trail. The trail starts out very steep but eases off a bit as it traverses around the mountain toward Glenwood Canyon. A picnic table is located at a spot called Artists Point where early settlers would take tourists to see the town below. As the trail travels above Glenwood Canyon there are nice views of Horseshoe Bend and the No Name area. We have seen bighorn sheep along the sides of the mountain at Horseshoe Bend. The trail continues climbing along a ridge that heads away from the canyon and more toward the summit of Lookout Mountain. As the trees give way to oak brush and mountain mahogany the climb levels out quite a bit. At the 2.5 mile point the trail comes to a junction where we turn and follow the left fork. 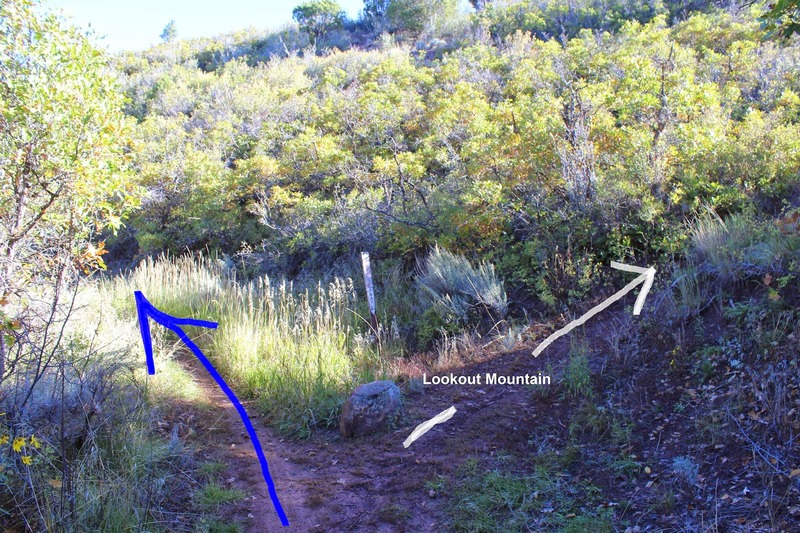 After a short distance there is another fork where the trail to the right leads up to the Lookout Mountain Park. For this post we continued straight ahead on the Forest Hollow trail. All the climbing is well worth it for the chance to hike the Forest Hollow trail. Here the changes in elevation are very modest as the trail follows a mostly flat line along the side of the mountain about 2000 feet above Glenwood Canyon and the Colorado River. The trail is thickly wooded for the most part with some interspersed sections of gamble oak. Ferns, moss and grass cover the mountain side in the cool shade of the trees. For this post we turned around at the Forest Service boundary. We could hear a bear a short distance off of the trail secluded within the thick oak brush. It apparently was on the trail after we went by the first time and probably got spooked back off the trail by a mountain biker shortly before we returned to this spot. We spoke with a couple of mountain bikers that were riding the whole 17 mile loop beginning and ending in Glenwood. Others were making use of a shuttle and just riding the downhill. We were a little embarrassed to discover that we had parked in a no parking zone when we returned to our truck. We had arrived early before the sun was shining into the valley and missed seeing a no parking sign that was partially hidden by a tree. At least we didn't get a ticket. We encountered about as many hikers as we did mountain bikers on the Scout trail. The scenery and such is good for 4 or 5 stars on this one but the total lack of parking anywhere around the trailhead is a real disappointment. If you would like to see it for yourself then all you have to do is grab your bike or 'Take a hike'.